While the entire experience was extraordinary, we had an unforgettable encounter with one couple and the wines they helped produce – Paul and Judy Champoux of Champoux Vineyards. Who said something funny? Probably Paul. It is hard to stand out when you grow grapes in Horse Heaven Hills. The region accounts for 25% of Washington State’s vineyard acreage, there is no shortage of award winning wines and winemakers, and a small number of large families have farmed huge expanses of land since there was nothing but scrubland. Paul and Judy make a statement. They purchased and nurtured vineyards that contain Block 1, the first grapes planted in Horse Heaven Hills by one of the founding families – the Mercers. They produced the Cabernet Sauvignon that helped Quilceda Creek earn a perfect 100 point score from Wine Advocate – in 4 vintages. They created a name that is synonymous with great Washington State Cabernet Sauvignon. It is not just their achievements that stand out. When our group arrived at their tasting room, Paul greeted us with a big grin on his face and arms spread wide. He was so excited about Horse Heaven Hills fruit. His spirit seemed to fill the space – and we were outside. Judy, a petite brunette with a gentle smile, was the picture of cheerful efficiency as she poured wines and made everyone comfortable. There are some folks you just like right off. It wasn’t until later that evening at dinner that we learned Paul’s spirit and Judy’s quiet strength had sustained them through a time of struggle. Paul was sitting in a wheelchair when we met him. A fact that it took me a beat to even notice given his enthusiastic personality. 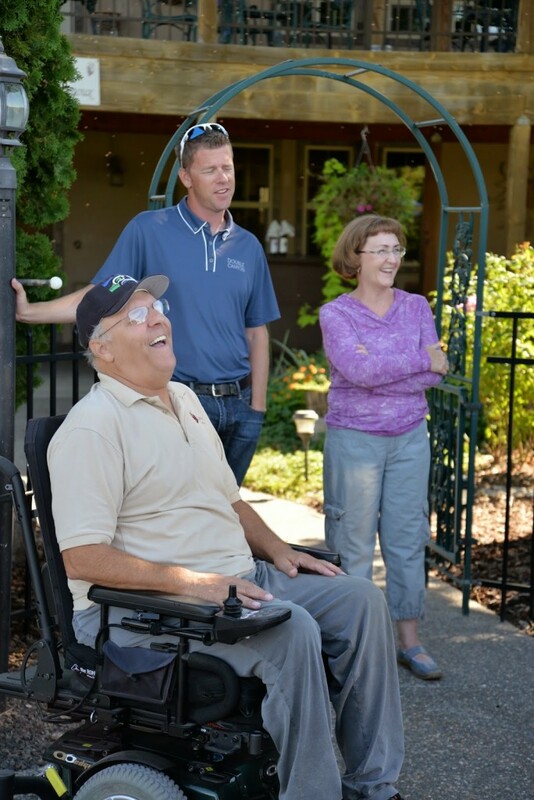 A mosquito bite and diagnosis of West Nile Virus 4 1/2 years ago impacted Paul’s mobility. In addition to being his business partner, Judy was his nurse. Paul is well on the mend now, tending the vineyards and even playing golf again. I had the privilege to speak with Paul right after his last harvest. Yes, Paul and Judy Champoux are retiring. It is bittersweet. Paul was excited about the quality of the harvest and hopeful about his plans for the future. Read the Wine Press Northwest interview here and learn more about this couple and their contribution to Washington’s wine industry.